Contributed by Wava Larson & Dolores (Mohr) Kenyon. The Billerbeck or Diphtheria Cemetery was read and photos were taken in May 2007 by Wava Larson of Alma Center. This cemetery is located in Section 6, T. 23N – R. 5W. Cemetery directions are Hwy 95 West of Alma Center to Hwy 121 West to Hixton-Levis Road. Travel approximately 2 miles north. 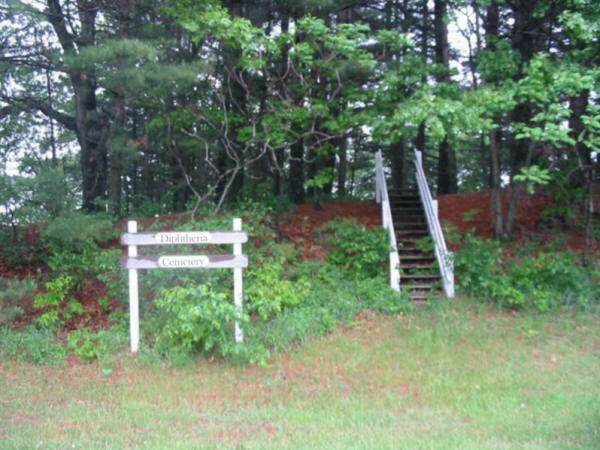 The cemetery is located on the left side of the road, on a hill, in a grove of pines and has a sign there and steps going up to the cemetery. There are other cemeteries in Garden Valley; namely the Curtis Cemetery (Section 2 on Old Stage Road), the West Garden Valley or the Swede Town Cemetery at the end of Swede Town Road, in Section 16, and the Stanford or Judkins Cemetery (Section 35), 3 miles north of Hixton along Hwy 95 on the right. This is a small, unkempt cemetery that possibly originated because of the effort to prevent the spread of the diphtheria epidemic during the late 1870s. The following news article is from the Badger State Banner of Jackson County dated on November 22, 1878. We can only assume that the unnamed markers could be the children of Henry Green.